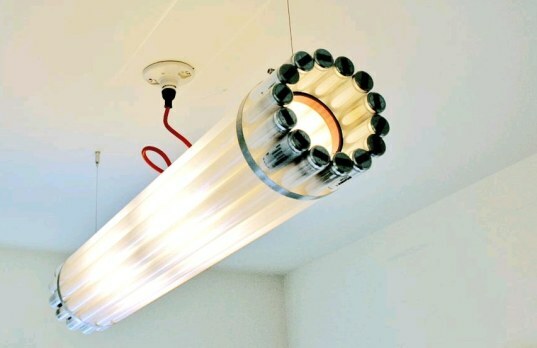 If you happen to have a large number of old fluorescent tubes and don’t know what to do with them, here’s the perfect idea for you! The Toronto based design collective known as Castor Canadensis fashions beautiful ceiling lights out of discarded old fluorescent tubular lightbulbs. 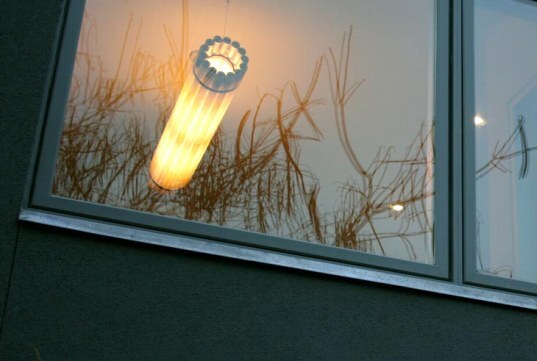 Castor Canadensis, a collective of craftmen and artists with eclectic background of craftsmentship and design, has created this stunning ‘Recycled Tube Light’ from refuse tubular lightbulbs. While it may look simple, as it is simply lamp made by wrapping a series of dead tubes around a pair of incandescent bulbs, what we really liked is the idea of repurposing an item which is very commonly disposed improperly, by throwing it into the trash, rather than the proper disposal that these tubes require. There are two versions, a slightly longer one, for hanging horizontally and a smaller 2 foot version for lying on the table or the floor. Now, if we could just get one that uses compact fluorescents instead of tungsten bulbs. how much do these lights retail for? I am looking to replace a traditional bulb light fitting and this light is ideal. can you please let me know how much they are? Haha! What a retard that castor is. "It's dangerous to have lightbulbs around your house!" Dude, are you currently living in the dark or something? I wonder how that works with mercury being used in fluorescent tubes and all. Not sure I'd want to keep them around my house that much. Plus as evets mentioned... accident waiting to happen if someting bumped into it. Not very practical. That's a genius idea. We should find the way to recycle the thing we don't want to make it more useful. Sometimes i will use the unwanted thing to make something like pencil box, container, flower vase and many more. My grand mum is a great maker. how about if the client sends the old bulbs to the designer in order to be recreated into this marvel? castor canadensis == beaver cute! Stick in some LED' into the tungsten sockets! Reckon it would look bloody awesome! Heres a site to buy the LED's from, and there CHEAP to! http://www.ledkoolight.com/products/index.htm Let me know how you go! Very nice idea. And Jeranon: they don't really look that bad, maybe just the way it is there, so yea doesn't look that good just hanging on the ceiling like that. But I think it can looking better attached to something or maybe like in a corner standing near the wall or something. "beautiful ceiling lights" as clever as this idea is... I gotta be honest, they look rather... hideous. If you happen to have a large number of old fluorescent tubes and don't know what to do with them, here's the perfect idea for you! The Toronto based design collective known as Castor Canadensis fashions beautiful ceiling lights out of discarded old fluorescent tubular lightbulbs.